Garba Shehu, presidential spokesman, says the service chiefs left the venue of the launch of ‘Next Level 2019’ after realising that it was a political event. The Atiku Abubakar campaign organisation had criticised the presence of the service chiefs at the event organised to unveil President Muhammadu Buhari’s scorecard and blueprint for his second term bid. The event took place at the Banquet Hall of the Presidential Villa, Abuja. 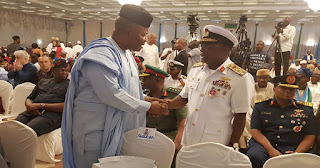 Reacting in a statement issued on Monday, Shehu said the service chiefs had wanted to witness the event but left “even before the arrival of the president”. The statement read: “They were mistaken in their assumption that this was a non-political event, to showcase the achievements of the administration, the success of which they are part. “Hardly were they seated than did the Minister of Defence, retired Brig-Gen. Mansur Dan-Ali ask them to leave as this was a political gathering. The Next Level launch was witnessed by All Progressives Congress (APC) governors, cabinet ministers, APC members of the national assembly and the president’s campaign organisation.